The very first TeleDongle boards were built from partially-populated TeleMetrum v0.1 boards and were, not surprisingly, called TeleDongle v0.1. The first dedicated PCB design, made to fit in small Hammond translucent blue box, "just worked". So we put it into production and sold several hundred over time. In hindsight, we should have renamed it to v1.0 when we put it into production. Then, since v0.2 and v2.0 just seemed to confusing, when we came up with an improved version we jumped straight from v0.2 to v3.0! 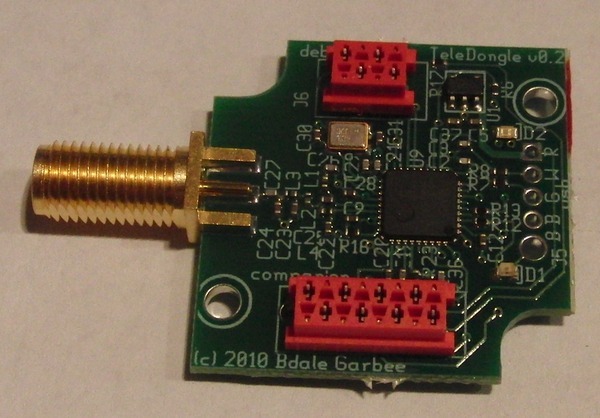 The v0.2 hardware design current gEDA files are available from git.gag.com in the project hw/teledongle.